Extensive information about technology imaging and printing is available in TUP – Technology User Profile. Consumer opinions on imaging and printing can urge a market toward higher-level technologies in what once seemed like unexpected places for imaging, such as mobile devices. An increase in camera phone use, or printing images from one’s mobile device might signal both digital camera and smartphone developers to step it up a notch. What is the breakdown of printer types and brands among workplace PCs users? How does this compare to printers used in the home? How does Hewlett Packard’s market share differ among the different types of printers (inkjet, multifunction, laser, etc.)? What are the major activities that people do with their printers? Who are the people moving from inkjet printers to laser printers? How about the other way around? Are these new printers replacement printers, or additional printers? Ink refill usage is substantial, especially among some leading-edge market segments. There’s an old marketing adage about giving away the razor to make it up selling razor blades. In the PC printer business, printer ink pays a lot of the bills, yet is increasingly at risk. In our most recent wave of Technology User Profile, American adults told us they continue to prefer original ink versus compatible or refilled cartridges. However, the ink loyalty rate varies by PC printer brand and market segment. One bellwether segment is decidedly using refills or sharing photos online. We started this analysis by first looking at the answers from 8,175 U.S. respondents in the Technology User Profile service and then drilled down further into their profiles including factors such as their printer brand, type of ink used, years of PC experience, and age. We also compared usage from our prior waves, including results from our identical surveys across nine other countries. In U.S. homes, original is strongest. Kodak & Lexmark have the highest ink loyalty, at 81% and 79%, respectively. Eight in ten adults who use these PC printer brands as their primary printer used an original ink cartridge by the same manufacturer as the printer. HP’s ink loyalty rate is not the strongest, with HP ranked third. HP is maintaining its strength: its ink loyalty rate at 73% is slightly up from 70% the prior year. These high ink loyalty rates may be satisfactory enough for some printer manufacturers, yet as consumers change their printing behaviors, and even non-printing behaviors, these rates are likely to change as well. 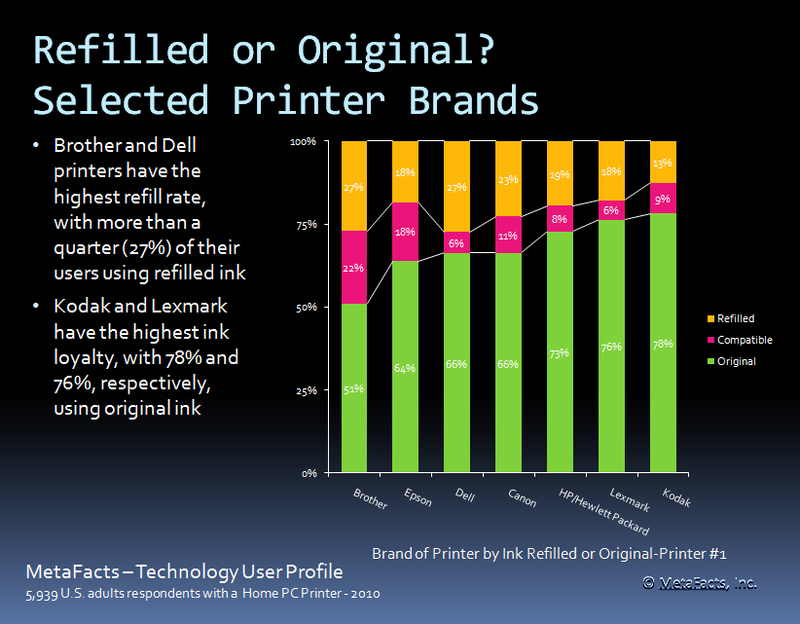 Use of refilled ink is highest for Dell and Brother, both with 27% of adult printer users. Due to HP’s dominant market share, the number of users of refills for HP printers is almost equal to users of refills for all other brands combined. The refilled market is broad and diverse, so unlikely to change overnight. It it served by a diverse group – spanning drug stores such as Walgreens, franchises like Cartridge World, to a small army of entrepreneurs and do-it-yourselfers with pliers and squeeze bottles. Direct competition is strong, although compatible inks trail refills as the least-preferred option across most brands. Use of competitive compatible inks is highest for Epson and Brother, at 19% and 18%, respectively. Compared with many other developed countries, the U.S. has some of the most ink-loyal consumers. Our prior wave of Technology User Profile across key countries revealed that ink loyalty rates are strongest in Japan and the US and weakest in Germany and the UK, and that use of refills is highest in South Korea and Germany. Looking ahead, the ink business continues to face challenges both from within the printer and ink industry as well as from substitutes. Printer manufacturers hoping to reclaim refill customers face an uphill battle beyond pricing, since a higher rate of refill users share photos online and a lower rate print photos. Adults who use refills have higher rates of using online photo-sharing services, sharing images across a social network, sharing on their own websites or blogs, and sharing folders online through a cloud storage service. They are an attractive segment, though, because when they print, they print at higher volumes. To the extent that younger users are bellwether of future buyers, it’s important to note that younger adults use refills at a higher rate than older adults. Looking further ahead, increased online collaboration is expected to continue the erosion of home-printing photos. 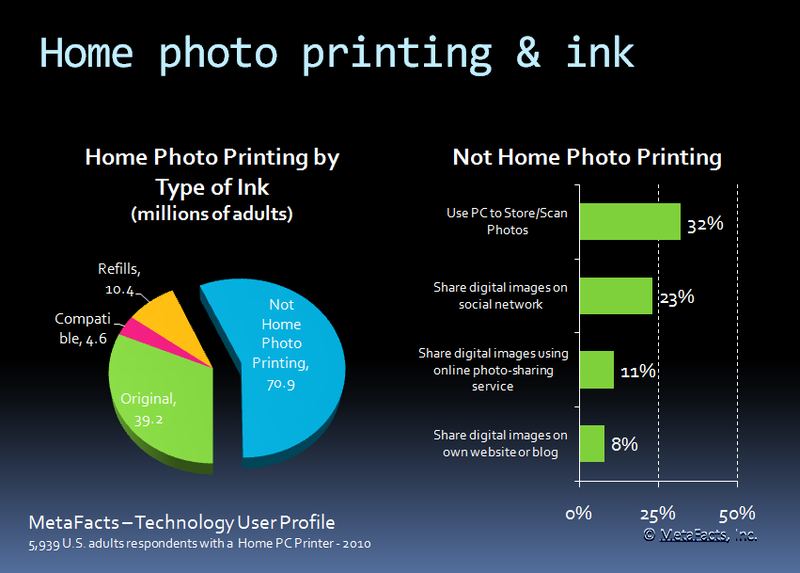 Of the 70.9 million adults with a home printer which they don’t use to print photos, most of their sharing is done online. The greatest upside is likely to come from the broad general increase in images from user’s own smartphones, feature phones and cameras, as well as the many photos they receive online from friends and others. Is email dying being replaced by alternatives such as social networking, texting, or IM?